In Every Organization, Every Person Matters. We chose the name, Mosaic Personnel, because we love the idea of mosaics. To create a beautiful mosaic requires numerous individual pieces to be placed intentionally in the right place. Being a part of the whole enhances the value of the individual pieces. In addition, the diversity of each piece of the mosaic adds to its depth and beauty. When creating a mosaic, every piece matters. When building a great organization, every person matters. Just as an artisan must have a vision of what they are seeking to create, leaders must have a vision for the culture they are trying to create. With each person hired, a leader shapes the present and future of their organization. An essential component in building a strong culture is the ability to consistently recruit, hire and retain talented and committed people. Mosaic Personnel is a part of C3 Brands, a family of companies that share a common mission to elevate life by promoting character and competence based solutions. At the heart of each company connected to C3 Brands is the C3 Concept. 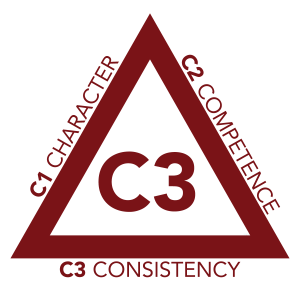 The C3 Concept suggests that the Consistency (C3) of an organization (or an individual’s life) represents its unique blend of Character (C1) and Competence (C2). C1: CHARACTER describes the mental model used to determine one’s actions. In organizations, it includes the cultural norms and values that guide decision-making. C2: COMPETENCE describes the knowledge and ability needed to do something well measured against a common standard. It is the capacity to solve technical problems. Have you noticed how many organizations tend to hire for competence but fire for character? To help ensure a great cultural fit between our candidates and employers, we integrate the C3 Concept throughout the recruiting process. Through this approach, our candidates gain insights into their character strengths, In addition, in collaboration with our sister company, Strata Leadership, LLC, we provide ongoing personal development opportunities through membership in Strata’s Character Core program and access to quarterly training programs. To help promote the success of our candidates, through our sister company, Strata Leadership, LLC, we offer world-class training opportunities and ongoing access to the Character Core System, which includes a monthly magazine designed to promote work-life balance and provide practical workplace support. We believe the person hired will have the greatest opportunity for success if they are hired for a job that fits both their character (C1) strengths and their competency (C2) strengths. Below are the 36 character qualities that are included in the Character Core. To learn more about the C3 Concept, we invite you to listen to the 2014 TEDx talk given by C3 Brands CEO, Dr. Nathan Mellor on the topic. In 2009, Dr. Nathan Mellor and Frank Smith founded Strata Leadership, LLC. Frank and Nathan were both deeply interested in the concept of workplace culture and the impact made in organizations through effective leaders. As a result, they wanted to create a company that could help individuals, teams and organizations by providing access to: assessments, executive coaching, curriculum, training programs and strategic planning services. As the company grew, clients routinely asked for assistance in “finding great people” and “telling our story.” In response to these needs, the principals of Strata purchased Principal Technologies, Inc. on January 1, 2016 and launched Qubit Creative soon thereafter. Principal Technologies was renamed Mosaic Personnel on September 1, 2016. Pam Fountain-Wilks founded Principal Technologies, Inc., in 1998. A respected business leader with a passion for promoting ethics and service, Pam built a vibrant business that focused on meeting the staffing needs of the IT industry. As the company grew, the industries served expanded as well. In time, Principal Technologies provided recruiting services for multiple industries including: Accounting, Engineering, Human Resources, IT and Administrative. A key focus in developing workplace culture is Frank’s willingness to help leaders with the relational side of business leadership, strengthening how their team works together. He believes that at the root of a great culture is the understanding of the balance between character and competence that allows an organization to run well. This belief is the reason for Mosaic’s focus on hiring for both character and competence. Mosaic will not look at a resume and assume a job fit based on competence alone. Because of our intimate understanding of business culture we always look at the character piece as well to ensure we place the right person in the right organization. We call it Connecting the Pieces. You can learn more about Frank’s role with Strata Leadership here.